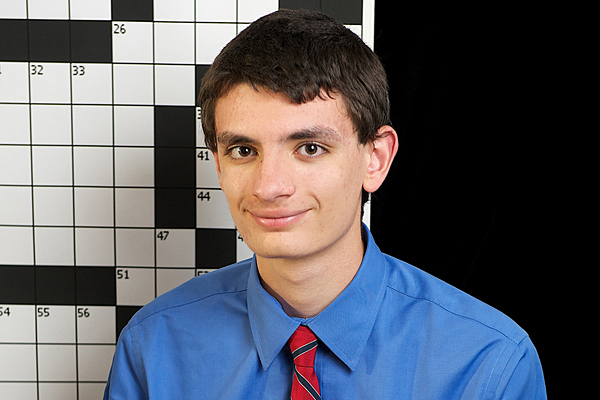 Alex Vratsanos has written the 11-11-11 crossword puzzle that will appear in Friday's New York Times. 8:33 a.m., Nov. 8, 2011--This Friday morning, some people will get up and start getting ready for weddings later in the day, while more superstitious folks might wake up with a sense of uneasiness about what 11-11-11 will bring. But University of Delaware freshman Alex Vratsanos will head for the Newark Newsstand to buy a keepsake copy of The New York Times. Friday’s crossword puzzle, a special tribute to the number 11, was crafted by the chemical engineering major and Honors Program student from Slatington, Pa. But 11 is apparently not Vratsanos’s only lucky number. He had his first New York Times crossword puzzle published on a date most people consider unluckythe 13th. That coincided with his high school graduation in June 2011. Vratsanos originally wanted to celebrate 10-10-10 with a special puzzle, but the idea didn’t come to him until late July of that year, and he quickly realized that he wouldn’t have enough time to complete it and get it through the review process by the deadline. So he set his sights on 11-11-11. Following another round of revisions, the puzzle was accepted. By then, Vratsanos was on a first-name basis with Shortz. Is he tempted to do another date-celebrating puzzle next year, on 12-12-12? Besides, Dec. 12 falls on a Wednesday next year, and Vratsanos says a Wednesday puzzle would probably not be as much fun to construct. He likes Friday because that’s the second-hardest puzzle of the weekonly Saturday’s is more difficult.